HONOLULU and PHOENIX (Dec. 10, 2018) — The Ford Island Control Tower, the historic structure that witnessed and withstood the attack on Pearl Harbor 77 years ago, will soon be fully restored with a new working elevator thanks to a generous gift from the Shoen family of U-Haul International. The announcement came Saturday evening at the Pearl Harbor Aviation Museum during the annual gala commemorating the events of Dec. 7, 1941 and the heroism of our WWII veterans. Watch U-Haul Chairman Joe Shoen’s video to Pearl Harbor and WWII veterans: uhaul.com/about/veterans. Repairs on the tower began in 2010, necessitated by decades of weather-related deterioration. This gift will allow the public to visit the tower’s upper deck, providing a 360-degree view of America’s first aviation WWII battlefield. Pearl Harbor attracts about 2 million visitors each year. U-Haul, founded by a U.S. Navy veteran and his wife as WWII was nearing an end in 1945, has been recognized repeatedly as a leading veteran-friendly employer. U-Haul proudly served as the Presenting Veterans Sponsor at the Pearl Harbor Day 75th anniversary opening gala in 2016. “The Ford Island Control Tower remains an iconic symbol of Pearl Harbor’s resolve and the brave veterans who served there, many whom gave their lives defending our freedom,” stated U-Haul Chairman Joe Shoen, son of company founders L.S. Shoen and Anna Mary Carty Shoen. 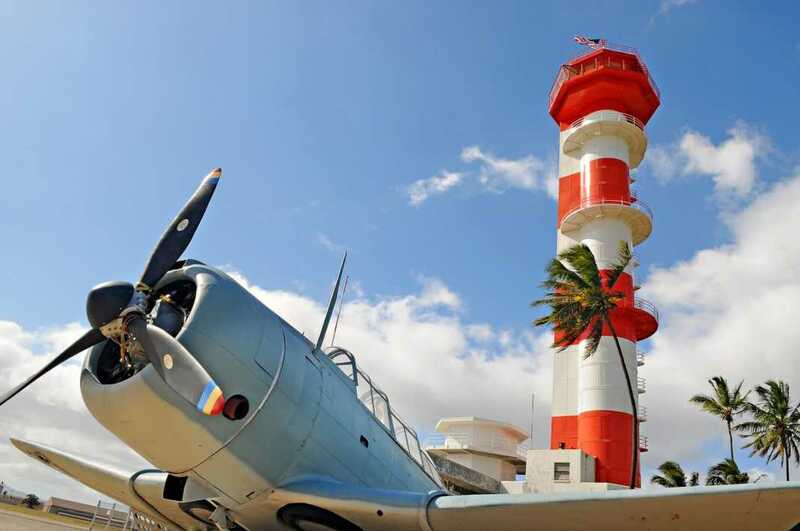 Elissa Lines, executive director of the Pearl Harbor Aviation Museum noted the restoration efforts on the tower will now be completed before September 2020, when the global commemoration of the 75th anniversary of WWII’s conclusion will take place. “This will be a day that we have all been dreaming about for many years,” Lines said. The Ford Island Control Tower was a new building when the attack on Pearl Harbor occurred, and was not painted until 1942. Today, the brightly striped structure is centrally located on the base, offering scenic views of the ships and memorials in the neighboring harbor. Among those memorials is the U.S.S. Arizona, which holds special significance to U-Haul and more than 3,800 of its 30,000-plus Team Members. The industry leader in do-it-yourself moving and self-storage has been headquartered in Phoenix since 1967. About U-Haul of Hawaii, Inc.
U-Haul of Hawaii, Inc. has been in operation since 1984, when its first Honolulu store opened. Today, U-Haul serves the Aloha State with company-owned facilities on Oahu, Maui and the Big Island, as well as 22 U-Haul neighborhood dealers across 16 cities. U-Haul soon plans to open a second store on the Big Island in Hilo, complementing its 2014 store acquisition in Kailua-Kona. U-Haul offers moving solutions, including U-Box portable storage containers, for families relocating between the islands or the mainland. Reach U-Haul of Hawaii president Kaleo Alau at 808-836-0970.